It is a 100W Power Supply Module/Power Converter/Adapter, Input Voltage: DC 5~32V, Output voltage: D.. It is a 100W Power Supply Module/Adjustable Voltage Regulator/Adapter, Input Voltage: 10~32VDC, Outp.. It is a 100W Adjustable Voltage Regulator/Adapter/Power Supply Module, Input Voltage: DC 3~35V, Outp.. It is a 100W Boost Charging Module/Adjustable Charger/Adapter/Power Supply Module, Input Voltage: DC.. It is a 120W Step-Up Converter/Boost Power Supply Module/Car Converter/Power Adapter, Input Voltage:..
120W boost DC to DC boost power converter, input voltage 10-32V, output voltage 35-60V, Maximum outp.. It is a 120W Boost Converter/Power Supply Module/Adjustable Voltage Regulator/Adapter, Input voltage.. It is a Automatic Step UP/Down Power Supply Module, Wide Input Voltage Range: DC 5 ~ 32V, Output Vol.. It is a 1500W Boost Converter/Power Supply Module/Adapter/Charger, Input voltage range: DC 10V~60V, ..
150W Power Supply Module/Adapter, input voltage: DC 10~32V, output voltage: DC 12~35V, Output Curre.. It is a 150W Charger/Power Supply Module/Adapter, Input Voltage: DC 10.8~35V, Output voltage: DC 35.. It is a 150W Power Supply Module/Adapter/Audio Power Supply, Input voltage: DC 12V, Output voltage: .. It is a 150W Adjustable Power Supply Module/Voltage Regulator/Adapter/Charger, Input voltage: DC 10~.. 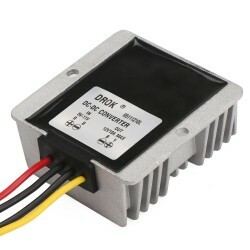 It is a 150W Adapter/Driver Module/Car Power Supply, Input voltage: DC 10~32V, Output voltage: DC 12..